The Gaspee Days Committee at www.gaspee.COM is a civic-minded nonprofit organization that operates many community events in and around Pawtuxet Village, including the famous Gaspee Days Parade each June. These events are all designed to commemorate the 1772 burning of the hated British revenue schooner, HMS Gaspee, by Rhode Island patriots as America's 'First Blow for Freedom' TM. Our historical research center, the Gaspee Virtual Archives at www.gaspee.ORG , has presented these research notes as an attempt to gather further information on one who is known to have been involved with the the burning of the Gaspee. Please e-mail your comments or further questions to webmaster@gaspee.org. I think I have discovered that the Dudingston family were in fact landed gentry in 17th and early 18th centuries and lived in the lands of St. Ford. The significance of this is that St Ford is, as is or was Earlsferry, part of Kilconquhar parish so any births and marriage there would appear in Kilconquhar parish records. James' ancestors had been awarded a barony in the area some three centuries earlier, but by our William Dudingston's time the estate had been mostly sold off in bankruptcy proceedings. But the family was still considered to be of noble stock. From the ScotlandsPeople site we also find that William's parents James Dudingston and Margaret Gillespie married on 17Nov1735 in Kilconquhar, and they had children: James (jnr) who died young, John born 1739, William born 1740, Ann, Clara, David and another daughter all of whom died in infancy, Elizabeth, Fanny, Anne, Sophia, Joanna, Margaret, Clara, Christian (female), and James who died 1794. William's brother John became a Major as a regimental surgeon in the 1st Regiment of Foot. William Duddingston's mother, Margaret Gillespie Duddingston, died before 1752. 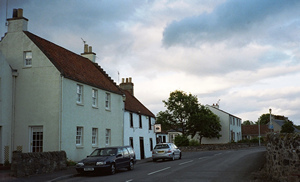 Right: The small village of Kilconquhar, Scotland in modern times. Photo courtesy of Karen Ellsworth, 2009. In searching for the genealogy, most people found spell the surname Duddingston with 2 middle d's, and almost all hail from Scotland. We have copies of documents signed here in America as Dudingston, with one middle "d". Perhaps William was trying to use a ruse to avoid his many lawsuits by deliberately misspelling his name. But he also used the one middle 'd' in his petition to the King for relief from his wounds. 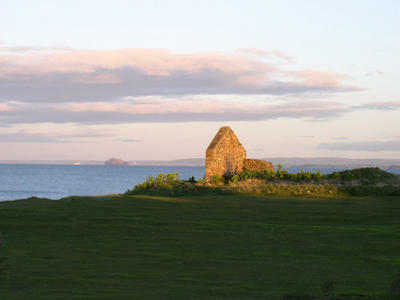 County Fife, where Dudingston was born, is a peninsula of the East coast of Scotland obviously conductive to maritime pursuits, and is across the Firth of Forth Bay from the city of Edinburgh, Scotland. From all of this, we can assume that our Lieutenant William Dudingston spoke with at least a moderately strong Scottish accent. According to the excellent Navy List database information kindly provided by CH Donnithorne, Dudingston was first commissioned in the Royal Navy as a Lieutenant on 10Oct1759. According to an N. Rodgers writing in The Wooden World: Anatomy of the Georgian Navy, p263, for a man to qualify for a commission as a lieutenant, he was required to pass an examination after having served a minimum of six years at sea, two of which were served as a midshipman or master’s mate. For this to be true, Lieutenant Dudingston had at least six years of experience at sea as an officer-in-training and must have entered into the Royal Navy sometime in 1753, at the tender age of 13. But his first command was that of the Gaspee schooner on 13Sep1768, so we feel the 1759 date more probably reflects his date of actual entry into the Royal Navy, and he must have become eligible for Lieutenant sometime after 1765. According to Gaspee pay records, Dudingston was assigned to command the ship on 26April1768, and first appeared 13Sept1768. William Dudingston first came to the attention of America in September 1768 at which time he took over command of His Majesty's Schooner Gaspee from his predecessor, Lieutenant Thomas Allen. In between this change of command, the Gaspee was refitted in (we think) the Philadelphia area (maybe even in Rhode Island) from a single masted sloop to a twin masted schooner. Dudingston and his fellow officers had both strict orders and generous financial incentives to intercept illegal smuggling along the American coast. British legislation deputized these officers as customs officials, and they were awarded a share of the value of any illicit cargo seized by them. According to Blue Water Patriots: The American Revolution Afloat by James M. Volo (2006) p14, by these means Dudingston himself supplemented his relatively meager annual income of £110 as a Royal Navy lieutenant by an additional £88 in one year alone. For an account of Dudingston's early dealings with the Colonists, see GaspeePriorTo1772.htm. But it was when Dudingston and the Gaspee entered Narragansett Bay in February of 1772 that this man really started to receive notice. His arrogance and deliberateness in carrying his duties of trade law enforcement soon got him in hot water. He straight-away stopped and seized one of the packet sloops owned by the powerful Greene family in East Greenwich, and he and his crew proceeded to beat up one Rufus Greene who commanded her. Dudingston condemned the sloop and her cargo as a prize of customs enforcement, and sent the boat to Boston for sale by the Admiralty based there. This incensed the sea-faring citizens of Rhode Island, and led to a questioning by Governor Wanton as to whether Dudingston and his schooner had the authority to act. That this led up to the destruction of the Gaspee on June 10, 1772 is all well documented elsewhere. After receiving surgery by John Mawney for his wounds during the attack, Dudingston was placed in a boat and put ashore into the house of Joseph Rhodes in Pawtuxet Village. There, after refusing to relate his experiences to to Dep. Gov. Darius Sessions, he was tended to for a few days by the well known local physician, Henry Sterling. He was subsequently removed to Newport to the home of his attorney, James Brenton, to continue his recovery. Because of rumored threats to Dudingston, the Royal Navy later took Dudingston under protective guard to the HMS Beaver <see Newport Skirmish>. Bob Brooks relates that he was promoted to the rank of 'Master and Commander' on 28 August 1772. Susequently he was shipped back to Europe, reportedly continuing his recovery at a French spa. Upon the loss of a ship, it was obligatory to undergo Court Marshal proceedings, which commenced in Portsmouth, England in October, 1772. At this, Dudingston was acquitted of any responsibility for the loss <See http://gaspee.org/StaplesAppendices.htm p134> We next hear from the Boston press that by November 1772, he was promoted from Lieutenant to Captain "by his Majesty's express command", <http://research.history.org/DigitalLibrary/BrowseVG.cfm>, although the Navy List cites his date of seniority for Captain to be five years later, on 19Sept1777. In December 1772, Dudingston petitioned King George for relief, citing his grievous wounds, and was subsequently awarded a 'Lieutenant's rate' pension of £91.5.0 on 15Feb1773 "in consideration of the courage and conduct shewn by him in defence of the Gaspee schooner, which was burnt at Rhode Island, in June 1772, and the severe wounds he received on that occasion." Dudingston claimed that he lost use of his left arm, and had a musket ball still lodged in his groin. In the American Federalist Columbian Centinel newspaper of 26Jan1822 (No 4241), page 1 is a letter to the editor entitled "Of Revolutionary Reminiscences. ", the author claims that, "Duddingston received a ball in the hypogastrick region, which ball was never extracted, but worked its way down near to the right knee, rendering him lame all his life." "Hypogastric" would be a medical description of the lower abdomen. It is unlikely that he was actually shot in the testicles, as he went on to father four children later in life. The most likely scenario is that Dudingston was shot once in the left arm, after which the bullet ricocheted or passed through into his left groin area containing the femoral artery and fascia. While John Mawney removed part of the musket ball, some of it may have remained that then traveled down to his knee over time. While all this was going on, the Greene family filed a series of lawsuits against Dudingston for the loss of their cargo aboard their sloop back in February 1772. Apparently arrests warrants were issued, and Dudingston complained to his superior, Admiral Montagu that he could not go on land out of fear of being arrested under Rhode Island law. For complete details on this sideshow, see Bryant, SW, Rhode Island Justice-1772 Vintage, Rhode Island History, July 1967 26:3, pp65-71. The Rhode Island Historical Society has a series of unpublished documents relating to these actions in its Manuscripts Division under miscellaneous Gaspee Papers. In this collection we discover that Dudingston was defended in these suits by James Brenton, at whose house in Newport he subsequently recuperated from his gunshot wound to the groin sustained during the attack on the Gaspee. Jacob Greene, Nathanael Greene, et al. filed suit against Dudingston for the amount of ₤295 at the Inferior Court of Common Pleas held in East Greenwich, and was appealed to the Superior Court. We have a letter from the William Checkley to the customs commissioners that Dudingston was actually served with a warrant for his arrest related to this suit immediately after the attack on the Gaspee <See http://gaspee.org/StaplesAppendices.htm#Top p113>. 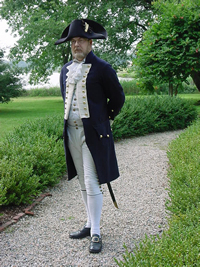 The suit was subsequently appealed to King George III, but was rejected in October of 1772. By this time, of course, the British were in no mood to entertain lawsuits regarding the Gaspee which had since been destroyed. We also note that related to this lawsuit, RI Chief Justice Stephen Hopkins issued another warrant for the arrest of Dudingston on October of 1773. By 18January1776, William Dudingston had apparently recovered enough from his ordeal and was given command of the armed sloop-of-war HMS Senegal<http://research.history.org/DigitalLibrary/BrowseVG.cfm>. Bob Brooks cites that because of deteriorating health, Dudingston was replaced in the command on 1June 1776 upon arriving in Halifax, NS, and spent the next year recovering further. A Firth is a Scottish term for a channel for the passage of ships. The HMS Boston was by one source a 32 gun frigate built in 1761. Bob Burke relates that this was a 6th-rate frigate of 28 guns. Dudingston was later promoted to Commodore, and eventually promoted to Rear Admiral, superannuated on 12Nov1794. The Navy List gives no further information about subsequent commands after he left the HMS Boston in 1782. We've thought that perhaps he was at Trafalgar in 1805 with Admiral Lord Nelson, but his name is nowhere on the list of known participants found at http://www.genuki.org.uk/big/eng/Trafalgar/. Effectively he made Admiral by living long enough to reach the top of the Captain's list. Making people 'superannuated' let the Admiralty promote and retire the less capable officers, and reach down the seniority list to promote the more promising candidates. This might be highly conjectural, but perhaps one reason that this apparently mediocre officer achieved the rank of Admiral was a combination of his war-related injuries, along with the ascendancy of his fellow Midlothian Henry Dundas, who as Treasurer and First Lord of the Admiralty gave many patronage positions to his countrymen. William Dudingston married on 17Nov1802 Antonia Steuart-Barclay (variations: Antonis Stewart) who was apparently much younger than her husband, as Will would've been at the age of 63-67 when they had the following children: 1. Elizabeth Hay Duddingston born on 30Nov1803 in Elie, 2, Unnamed male Duddingston born 1Dec1804 and died 8Dec1804, buried in Elie Churchyard, 3. William Montague Duddingston born 01SEP1806 in Edinburgh Parish, Edinburgh, Midlothian, Scotland, and 4. Susan Sterling Duddingston born on 7Nov1807, registered in Edinburgh. Both William Jr's and Susan's births are listed to a William Admiral Duddingston and Antonia Stuart, so we can assume that Will had made Admiral by 1806. It is noteworthy that our Dudingston conferred to his son the middle name that is the same as the last name of his Admiral during the Gaspee Affair, John Montagu(e). Perhaps there was some relationship here as we feel it would be highly unorthodox amongst British traditions to go outside their immediate families for names, even if just a middle name. In either event William Montague Duddingston died without issue sometime before 1839. 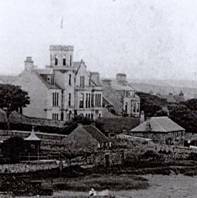 Interestingly, both of Will's daughters died in Paris, France, Elizabeth having married a Mr. Boyd at sometime before she died in 1866; Susan died unmarried in 1890.
re his wife you might be right that she was moneyed – her father lived in Collarnie Castle see http://canmore.rcahms.gov.uk/en/site/31474/details/collairnie+castle/ and that suggests to me even more that William did not come from an impoverished background – it would be unusual for a person to marry into such a family unless he had some pedigree. In either event, Dudingston must have accumulated considerable wealth by some means or another. According to his will, he owned two homes; one house was on Heriot Row, to this day an upscale address within the center of Edinburgh, Scotland. His 'country" estate in Earlsferry, Scotland was created of hand-hewn stone with an opulent interior that continually impressed local citizens up until the house was demolished around World War II.. Earls Ferry (now spelt as one word, Earlsferry) is a seaside village in Will's hometown of Kilconquhar, and is directly across the Firth of Forth from Edinburgh. Admiral William Duddingston died 27October1817 in Earlsferry, Fife at the age of 76. His widow, Antonia Steuart Duddingston died at No. 4 Heriot Row on 19Nov1839. We found Will's will in the British Public Records Office: at http://www.documentsonline.pro.gov.uk/ Prerogative Court of Canterbury and related Probate Jurisdictions: Will Registers, Effingham Quire Numbers: 606 - 651 Date 19 December 1817. One can see the copy of the will first hand by paying a ₤3 credit card charge to the Public Records Office. The text is difficult, and is from the will and challenges thereafter, all in the handwriting of a clerk who copied the document into a bound volume as a master record. I William Duddingston, Rear Admiral of his Majesty's Fleet, residing at present in Earls Ferry, Fifeshire, being in possession of my faculties, sound in memory and judgment and considering the uncertainty of this life I do ordain this my last will and testament, revoking all former wills and testaments. I bequeath to God a Soul polluted with many sins but hope purified by repentance and trust redeemed by Jesus Christ. I leave ₤15466 in 5 pr ct Annuities also in the 5 pr ct 5477 in the public funds the Dividends of which are reserved by Messrs Hodsoll & Stirling Bankers in London all this above mentioned propertys I leave I say to Sir Walter Stirling, Barrister and Walter Urquhart, Esquire of Baddow in the County of Essex jointly with Antonia Duddingston my wife in Trust for the following uses and purposes including all balances of money that may be in the hands of Messrs Hodsoll & Stirling or Sr Wm Forbes & Co in Edinburgh at the time of my decease. That is to say to pay to my two Daughters Elizabeth Hay Duddingston & Susan Stirling Duddingston two thousand pounds each when at the age of twenty one years at my death they shall receive the Interest of their portions of my house in house in Heriot Row Edinburgh and furniture. I bequeath to my wife Antonia with the power to sell it should she think it for the Interest of her family the House in Earls Ferry, Fifeshire. I bequeath with the furniture to my two Daughters by Contract of Marriage two hundred pounds per annum was used my wife's Jointure during her life I now add to it one hundred more in all. Three hundred pounds per annum the residue of all my property & Effects after paying the aforesaid portions to go to my son William Montagu Duddingston. Should he die before he is of age his property to be equally divided between his two sisters, and should either of them die the remaining sister to have her portion. Appeared Personally Thomas Archibald of Elie and Alexander Miln of Elie and jointly and severably made oath as follows that they know and were well acquainted with William Duddingston, Esquire, an Admiral in his Majesty's Navy formerly of Elie Lodge, and late of Chapel Green, Earls Ferry in Fifeshire, North Britain deceased, and also with his manner and character of hand writing and subscription having often seen him write and also write and subscribe his name and having now carefully inspected the paper writing currently arrived purporting to be the last will and testament of the said Deceased the same beginning "In the Name of God Amen. I William Duddingston Rear Admiral of his Majesty's Fleet residing at present in Earls Ferry, Fifeshire, being in possession of my faculties, sound in memory and judgment and considering the uncertainty of this life I do ordain this my last will and testament, revoking all former wills and testaments" Ending "and should either of the die the remaining sister to have her portion" Dated Chapel Green, Earls Ferry, Fifeshire 15 November 1816" and subscribed at the bottom of the first page there of "W. Duddingston" and at the bottom of the second page and the conclusion of the said will also subscribed "W. Duddingston" they say that they do verify and in their conscious believe that the whole body series and contents of the said paper writing the date thereon and the subscription thereto is of the proper handwriting & subscription of the aforesaid Admiral William Duddingston deceased. Thomas Archibald, merchant, and Alexander Miln, Shoemaker of Elie. On the fourth day of December 1817 the said Thomas Archibald and Alexander Miln were duly sworn to the truth of aforegoing affidavit before m Robert Mattman, Magistrate of Elie County of Fife, North Britain. On 19th December 1817 Admon with the will annn at the Goods Chaffers and Credits of William Duddingston an Admiral in His Majesty's Navy formerly of Elie-Godyr but late of Chapel Green Earls Ferry Fifeshire North Britain deceased was granted to Antonia Duddingston widow the natural and lawful mother wife of him and Curatrix or Guardian lawfully assigned to William Jr.out after Duddingston a minor the Son the residuary named in the said will the use and benefit of the said minor and until he shall attain the age of twenty one years being first sworn commission duly to asure No Exor. Right: Warwick historian John Currier portrays our infamous Lt. William Dudingston during Gaspee Days each year. Courtesy of Holly McKenzie (who married into the Duddingston line of descent--against our advice, we might add) we have the Settlement Inventory of William Dudingston's estate taken 4 or 5 years after his passage. In presence of Robert Low Esquire of Clatto Commissary of St Andrews Compeared Mr James Stark Writer in Cupar as procurator for Antonia Stewart alias Duddingston after designed and gave in the Inventory and Probate of the Will under written desiring the same might be recorded in the said Commissary Court book in terms of the act of parliament which desire the said Commissary found reasonable and ordained the same might to be done accordingly whereof the tenor follows. Inventory of the Personal Estate of William Duddingston Esquire Rear Admiral of His Majesty's Fleet who died at Earls Ferry in the County of Fife on the twenty seventh day of October Eighteen hundred and Seventeen years. Faithfully given up by Mrs Antonia Stewart otherwise Duddingston his Widow and Executrix. The deceased was also possessed of the following sums in the Government Funds. At Edinburgh the Fourteenth day of November Eighteen Hundred and Twenty one In presence of George Carphin Depute Clerk of the Commissariot of Edinburgh Commissioner appointed by the Commissary of Edinburgh for taking the following Deposition. The foregoing Inventory and Deposition was presented by Mr James Nairne Writer to the Signet and recorded along with the relative deed in the Register of Inventories kept for the Commissariot of Edinburgh conform to act of parliament by me Deputy Clerk (signed) George Carphin. TO DRESS A SHEEP’S HEAD. 742. INGREDIENTS.—1 sheep’s head, sufficient water to cover it, 3 carrots, 3 turnips, 2 or 3 parsnips, 3 onions, a small bunch of parsley, 1 teaspoonful of pepper, 3 teaspoonfuls of salt, 1/4 lb. of Scotch oatmeal. Mode.—Clean the head well, and let it soak in warm water for 2 hours, to get rid of the blood; put it into a saucepan, with sufficient cold water to cover it, and when it boils, add the vegetables, peeled and sliced, and the remaining ingredients; before adding the oatmeal, mix it to a smooth batter with a little of the liquor. Keep stirring till it boils up; then shut the saucepan closely, and let it stew gently for 1–1/2 or 2 hours. It may be thickened with rice or barley, but oatmeal is preferable. Time.—1–1/2 or 2 hours. Average cost, 8d. each. SINGED SHEEP’S HEAD.—The village of Dudingston, which stands “within a mile of Edinburgh town,” was formerly celebrated for this ancient and homely Scottish dish. In the summer months, many opulent citizens used to resort to this place to solace themselves over singed sheep’s heads, boiled or baked. The sheep fed upon the neighbouring hills were slaughtered at this village, and the carcases were sent to town; but the heads were left to be consumed in the place. We are not aware whether the custom of eating sheep’s heads at Dudingston is still kept up by the good folks of Edinburgh.